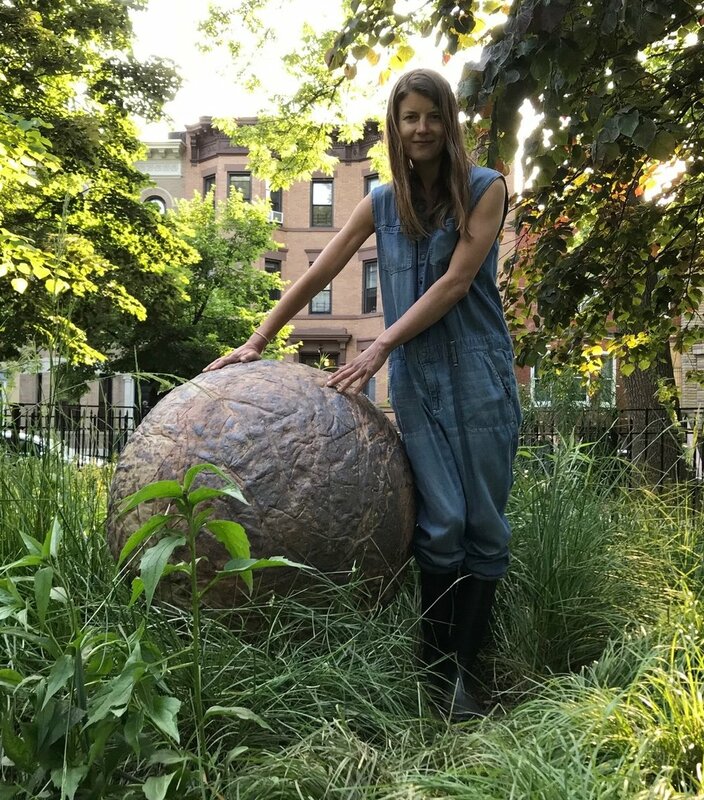 3' diameter ceramic orb atop a native plant garden in McGolrick Park, along Russel St. between Nassau Ave and Driggs Ave.
Ziemia: Our Stories Are Written in Soil is a public-art project created in collaboration with residents of Greenpoint, Brooklyn, NY that was recently completed and installed in June 2018. In the form of a ceramic sphere atop a native meadow in McGolrick Park, the piece bridges divides between the neighborhood’s disparate subcultures by serving as a collective portrait of the community through embodying residents' personal homelands and migration stories. Greenpoint is currently experiencing a demographic transformation as gentrification pushes out many longtime residents. With the rising displacement and relocation of peoples across the world, Ziemia responds to the need for collective reflection in communities on migration as not merely a global phenomenon, but as a local, micro experience that unites us all. 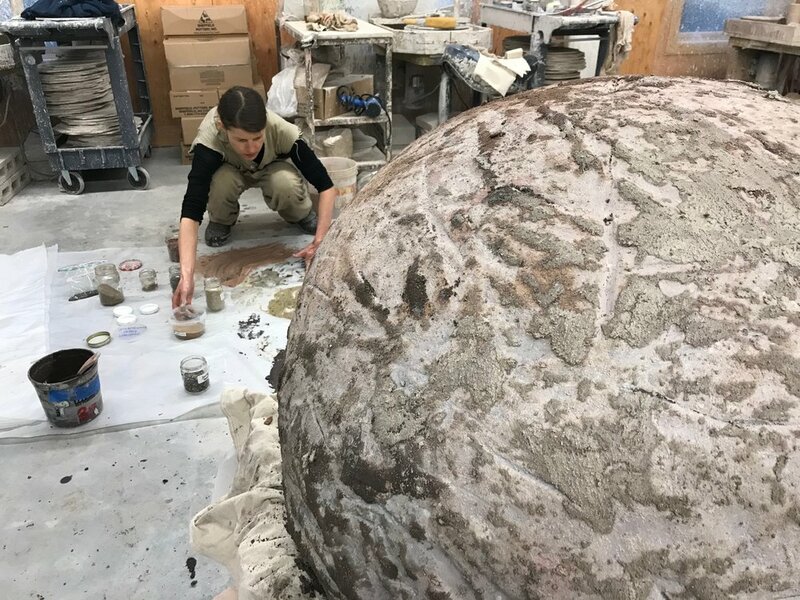 This ceramic orb is glazed with a mixture of clay excavated in Greenpoint, and soils contributed by participating residents from places that are symbolically representative of their identities, including: The United States, Poland, Ukraine, Germany, France, Japan, Serbia, Nepal, the United Kingdom, Ecuador, Mexico, and Namibia. The project includes many Poles who have lived in Greenpoint for generations, and the artist personally traveled to Poland to collect soil on behalf of Polish residents who were unable to make the journey. The ceramic orb in the meadow in McGolrick Park. With soil--universally symbolic for one's roots and identity--as the medium, Ziemia gestures to the primal connection to Earth that underlies each individual’s migratory experience. As the transitionary phase in nature between death and life, soil refers to the cyclical patterns of neighborhood growth and change. The materials were chosen specifically for their significance in Greenpoint's history. The meadow, composed of native and doppleganger plant species, references Greenpoint's pastoral past as the once fertile land that sustained Native Americans and settlers. The public art piece serves as a central location for events to encourage cross-cultural exchange and initiate dialog about immigration and the human relationship with the natural world. The international soil was imported with an official USDA soil importing permit and heat treated by a team of chemistry research students at Lehman College. The students have have been important partners in the project and are conducting testes on the the soils for mineral content as well as traces of pollution. The project aims to bring attention to the ties, both sentimental and vital, that we have to the land we call home. Follow the project on Instagram for the most recent updates! 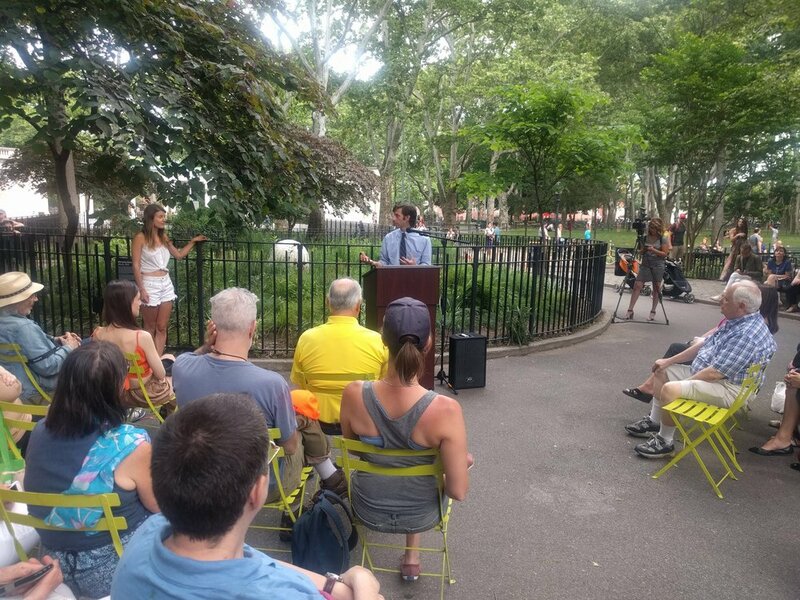 On Saturday, June 9th 2018, Greenpoint residents were invited to the unveiling of the completed Ziemia public art project in McGolrick Park. The celebratory reception included art workshops, Polish food, and speeches by Congresswoman Maloney, Assemblyman Lentol, Council Member Levin, Jennifer Lantzas of NYC Parks, Anna Domanska the director of the Polish Cultural Institute, neighborhood historian Geoff Cobb, and artist Martynka Wawrzyniak. In May 2018, a short film documenting Wawrzyniak's journey to collect soil for the Ziemia orb on behalf of Polish immigrants living in Greenpoint, was featured at the Greenpoint Film Festival. As a conceptual artist, I develop collaborative, research-based projects that traverse varied mediums and disciplines, engaging the audience through sensory experience. The medium—whether photography, installation, video, performance or sculpture—is matched to each project’s conceptual foundation. My works utilize corporeal sensation as a vehicle for communicating ideas about primal experience, memory, and sociocultural issues. By reframing common everyday materials through experimental procedures, the works generate subjective, visceral, and often confrontational experiences. With Ziemia I am interested in surrendering more of the creative process to a wider group of participants who can interact with the work in deeply personal ways.